Managing Technology to Meet Your Mission is a practical resource that will help nonprofit professionals make smart, strategic decisions about technology. The book shows how to effectively manage technology and offers practical advice for decision makers and staff alike who often have little or no experience with technology. "This invaluable guide for nonprofit leaders proves that nonprofit organizations can and should embrace technology, rather than being scared of or intimidated by it!" Kristie Ferketich, senior strategist, Google Grants, Google Inc.
"NTEN's Managing Technology to Meet Your Mission can help leaders craft a technology strategy that makes sense and builds ROI while also providing inspiration for their staff and supporters!" 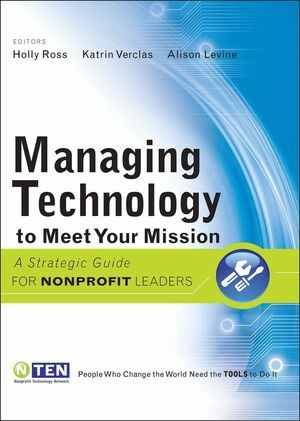 "This book shows what NTEN does best: Bring together a wide range of voices to provide practical technology strategies and know-how to help nonprofits more efficiently and effectively move their own missions forward." Holly Ross is the executive director of The Nonprofit Technology Network (NTEN). Katrin Verclas is a former executive director and current board member of NTEN. She is an IT consultant and project manager. Alison Levine is a special projects fellow with NTEN and has worked in the nonprofit sector for over ten years. The Nonprofit Technology Network (NTEN) provides hands-on training, sector-wide research and a network of peers to nonprofit staff to help them effectively use technology in their work. They believe that technology allows nonprofits to work smarter, more efficiently, and with greater social impact. PART ONE: PLANNING AND PEOPLE. Chapter 1: Mission First: Achieving IT Alignment (Steve Heye). Chapter 2: Managing Technology Change (Dahna Goldstein). Chapter 3: Measuring the Return on Investment of Technology (Beth Kanter). Chapter 4: How to Decide: IT Planning and Prioritizing (Peter Campbell). Chapter 5: Finding and Keeping the Right People (James Weinberg, and Cassie Scarano). Chapter 6: Budgeting for and Funding Technology (Scott McCallum, and Keith R. Thode). Chapter 7: The Foundation: Introduction to IT and Systems (Kevin Lo, and Willow Cook). Chapter 8: Where Are Your Stakeholders, and What Are They Doing Online (Michael Cervino)? Chapter 9: Effective Online Communications (John Kenyon). Chapter 10: Donate Now: Online Fundraising (Madeline Stanionis). Chapter 11: Where Will We Be Tomorrow (Edward Granger-Happ)?